This homemade jalapeno hot sauce is a very basic hot sauce recipe that you can make on the stove-top. This recipe is fairly similar to this habanero hot sauce recipe, but jalapenos are much milder and easier to eat in greater quantities. 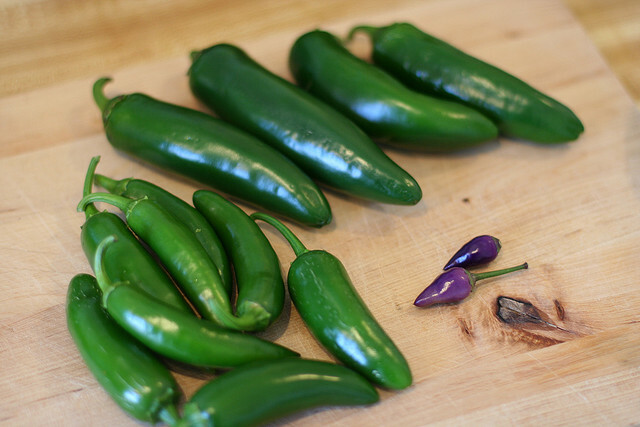 For this recipe you will need about twenty fresh jalapeno peppers. 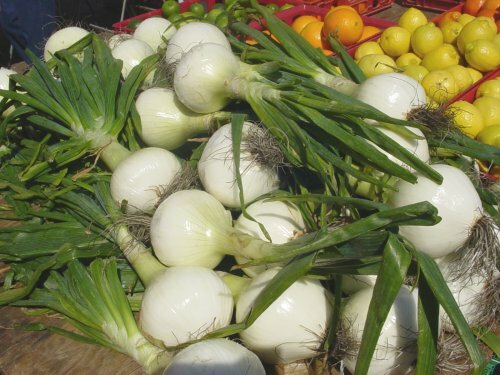 You will also need fresh garlic and onion. A little bit of salt and vinegar will be required as well. You will also need vegetable oil for preparation, and some water. Hopefully you know where to find water. Chop up about twenty fresh jalapeno peppers. You can slice them, dice them, whatever you’d like. They will be run through a food processor later, anyways. Chop up three to four garlic cloves and a medium onion as well. Coat a medium saucepan with a bit of vegetable oil and heat over high heat. Combine the sliced peppers, garlic, and onion and saute for four or five minutes. Add about three quarters of a teaspoon of salt while sauteeing. Add two cups of water and cook the mixture, stirring often. After about twenty minutes, remove from heat. Once the mixture cools to room temperature, pour everything into a food processor and puree. Slowly add one cup of white vinegar during the pureeing process. And you’re left with a delicious jalapeno pepper spicy hot sauce. If you pour the mixture into a sterilized jar it can be kept in the fridge for four to six months. For a thicker sauce, process less. For a runnier sauce, increase the amounts of water and vinegar slightly. 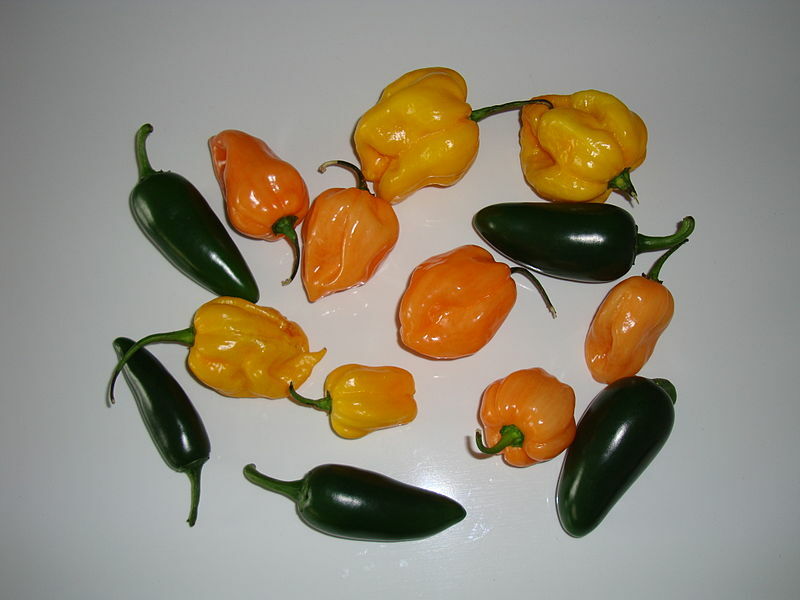 For a spicier hot sauce, try out this habanero hot sauce recipe instead. For something more “mass-market” approved you can check out our knock-off recipe for Frank’s Red Hot. Somehow, a recipe created over a hundred years ago by the “Frank Tea and Spice Company” is dominating the entire hot sauce market and has been for a surprisingly long time. This thin, vinegary hot sauce has become the standard to beat. Frank’s Red Hot Sauce. But if you use a lot of hot sauce, you should make something better. Not only is it easy to make a thicker more delicious hot sauce, but you will actually have control over how hot you choose to make it. This recipe starts out with an easy part. All you need to do is put everything in a blender or a food processor. Drop in a small onion, 5-6 habenero peppers and 5-6 jalapeno peppers. Pour in two cups of vinegar. Now blend it all up until its all creamy and smooth. Add the blended mixture to a heated saucepan, bring to a boil and reduce the heat. Simmer the whole thing for about fifteen to twenty minutes and sprinkle in some salt and pepper to taste. This process ensures the flavors will be nicely mixed and you end up with a consistent sauce. The best part is, because it’s made with vinegar, this stuff will last quite a while. So you can make it and use it like you would any other hot sauce. Substitute a portion of the vinegar with fresh lime juice for a citrus variation. 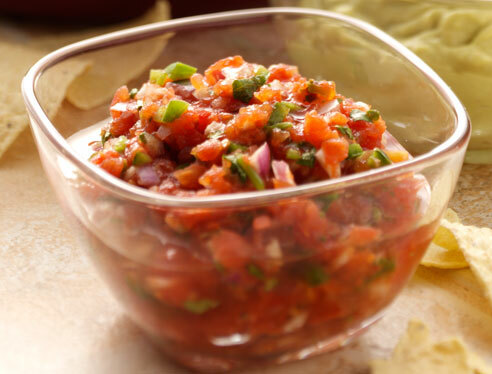 Adjust the heat by substituting out some of the jalapeno and habanero peppers with regular green or red peppers. Adding a teaspoon of sugar can help make the hot flavor linger longer. This is a very easy chili recipe that you can cook on the stovetop with any decent sized pan. Preparation is quick and painless, but if you want this chili to turn out great, you should give yourself time to cook it for a while. In your frying pan, heat a tablespoon of oil on medium to high heat. Once your pan and oil preheat, add your ground beef. While you’re waiting for the oil to heat and the beef to brown, start chopping up all your vegetables and your garlic. Once the beef has browned, throw in your chopped celery, a fairly finely chopped onion, and two or three crushed garlic cloves. Cook until the onion begins to soften. Now add everything else. For your spices, a good guideline is one tablespoon of chili powder, oregano, thyme, and cayenne pepper. But like I said, there really isn’t a “wrong way” to flavor a chili. Cover and cook for a minimum of one hour over low heat. There is pretty much no way to cook a chili for too long, as long as you’re simmering at a nice low temperature. When it comes down to it though, you should just buy a slow cooker and cook a larger quantity for much longer. Most of the time a recipe of this size is meant to be for between four and six people. I’d recommend keeping it to yourself, or maybe sharing with one person maximum. If you don’t like kidney beans you can substitute them out for more ground beef. Seriously, cook this thing at low heat for a really long time. It’ll just turn out better if you’re patient. If you premake a batch of chili powder it can simplify the chili-making process as well as be used in other recipes. 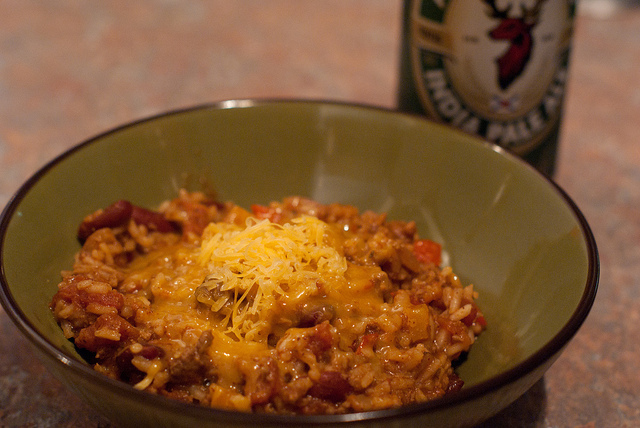 Every time you make a bowl of chili, cover the whole thing with cheese. As pictured above.